for £5.99[UK]/7.50[USA] postage paid World-wide. For many of us these are two old friends. Until now they have seemed irremediably separated by commerce and copyright. DG might just as easily be the Montagues to EMI’s Capulets. That said, one never knows whether the classical heritage of the financially distressed EMI Classics will end up in the back pocket of Universal. For now these friends meet in the moonlight and lightning conjured at super-budget price by Alto. As we have seen there are constant waves of reissues sent on their merry way by the progressive lapse of copyright – which varies from one state to another. This disc is but one example of a marriage facilitated by the swelling public domain. One can imagine the companies checking Gramophone from the early 1960s, finding mint copies of LPs and laying their reissue and renovation plans months ahead as legal protection expires. Unless the law changes – surely on the cards – the classical recording landscape, whatever the favoured format by then, will seem startlingly different even ten years from now let alone thirty or forty. These two recordings are truly iconic: pillars of the catalogue and the source of income-yielding reissues in every format: Richter and Michelangeli. Richter’s phenomenal pianism will continue to please and amaze. However, in all the glamour around Richter let’s not forget the imaginatively romantic role played by Wislocki and his Warsaw players. The orchestra’s spitfire fury in the finale of Rachmaninov 2 continues to surprise, impress and please. Richter’s trademark delicacy and romantically fuelled power is undeniable and again affirms for new listeners why this reading is so loved. 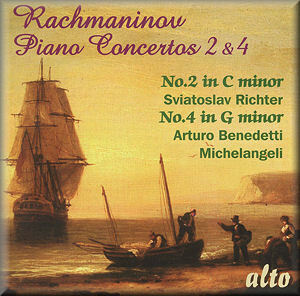 Michelangeli has to contend with the much less well known Fourth Concerto. Yet he made of it a thing all his own and of brooding and imperious exuberance. The playing is phenomenal: listen, for instance, to his satin and obsidian staccato at 5:40 in the first movement. Gracis is even more obscure than Wislocki. However, he too draws delightful playing from these London musicians. The Fourth emerges here as so much more than its painting-by-numbers also-ran reputation. There are more recent versions with the benefit of full digital sound. These include very fine readings of the four concertos by Lill (Nimbus), Hough (Hyperion) and Trpceski (Avie Avie), Memorable cycles brimming with unruly character can be had from Marshev (Danacord) and Wild (Chandos). These two classics however need to be heard and are grateful to mind and heart.